Welcome to the Farmingville Historical Society! 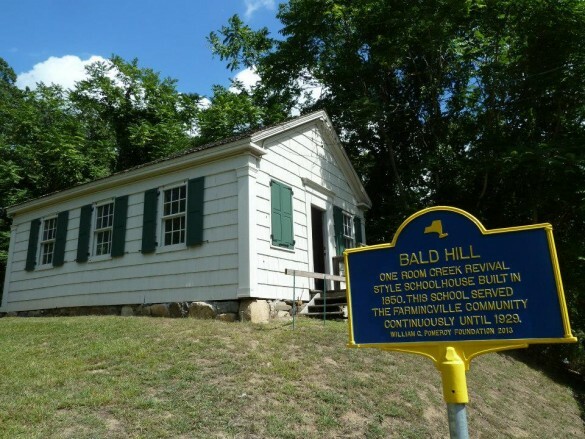 The Farmingville Historical Society was initially formed in 1992 to preserve and restore the Bald Hills Schoolhouse. The Bald Hills Schoolhouse is a one-room Greek Revival Schoolhouse built in 1850. The Schoolhouse served the Farmingville Community until 1929. After 150 years of being closed, the Schoolhouse was re-opened in November, 2013 to serve the community through student field trips. In addition to the Schoolhouse, the Farmingville Historical Society is also focused on preserving and restoring the Elijah Terry House and relocating, restoring, and preserving the historic Firehouse. Subscribe to our email list and we will keep you posted on our progress and invite you to our events.